Sometimes it is convenient to "turn off" Camera3D and run the sketch without any special effects. It would be somewhat sloppy coding to comment out the lines of code involving Camera3D to deactivate it. A more convenient approach is a Camera3D Generator that doesn't do anything special. This is the purpose of the Regular Renderer Generator. 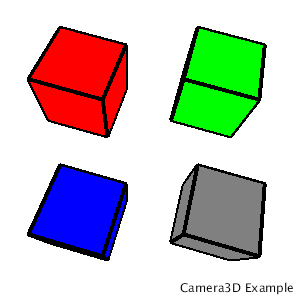 After creating the Camera3D instance, you can tell it what kind of Generator you want to use. Here, we select the Regular Renderer Generator using the regularRenderer method. This is also the default Generator that is selected if your sketch does not explicitly tell it to use something else. The complete example is below. Many of the Generator examples are based on this rotating box sketch.